Every Wednesday afternoon a shipping container in our parking lot gets opened up and crowds swell to work on their bikes. Many folks in our community depend on bikes to get around, but don’t have access to tools or parts. 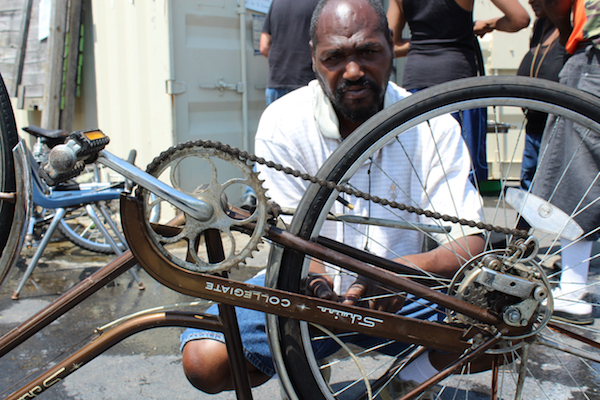 With the help of our resident bike mechanic Mr. Howard we make sure people ride away with smile on their face. We can always use an extra hand to help work on bikes. Community bike shops goes from 12:30pm – 2:30pm. We can also always use donations of parts in particular 26, 27, and 700 tires, tubes and wheels. We also can always use more bike tools and pumps.